And so to day 3. Decided there was far too many cars whizzing about yesterday - and my mind was made up when one car, overtaking on the strait to Cerrigydrudion actually just clipped the excess material on my coat with his wing mirror. The solution being to walk at a time when, theoretically at least, everybody else is still in bed. Leg 1 : Bod Petrual crossroads to Glan Llyn Inn, Clawdnewydd. 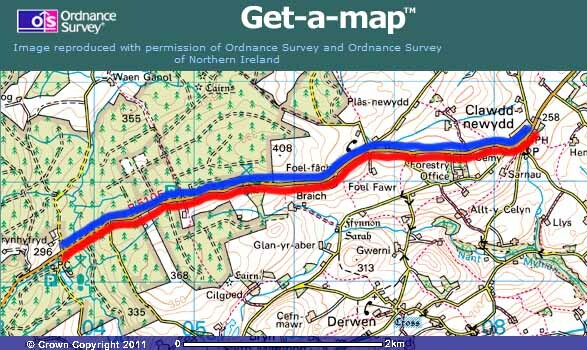 Leg 2 : Glan Llyn Inn, Clawdnewydd to Bod Petrual. Alarm, 6am. Tiptoed out. Starting walking 6.33am (first light). You really are in the realm of the nutter when you walk the verges at dawn, taking photos seemingly at random. Luckily there were few cars about to ponder my suspicious activities. Needless to say, nobody stopped today. Car drivers are dangerous, inconsiderate, selfish, insensitive buffoons. I drive a car. 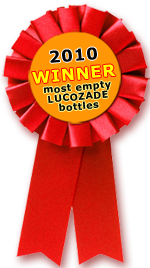 I have now developed the ability to sniff out lucozade bottles, not only at distance, but buried beneath road-side detritus. 1 x dead badger, 1 x out of luck pheasant. 1 x Fieldfare with broken wing - unable to help alas. Realised what a great pleasure I have been missing all these years by never being out this early before.